A quick look at a handsome and delightful carpet. What is most interesting about ‘Menagerie’ is the overall composition and juxtaposition utilizing elements that are, in reality, quite texturally distinct. Large and looming elephants with their eraser like skin. Pouncing Cheetahs with ostentatiously soft and contemporaneously verboten pelts. Peacocks with wispy and delicate feathers. Verdant and fern like foliage swaying gently in a cool forest breeze. All of these elements rendered and re-imagined in luscious and variable combinations of Tibetan wool, silk, and natural nettle fibres. The beige (or tan according to the official description) all Tibetan wool field serves – as a neutral most often should – as the soothing backdrop to a vibrant palette featuring forty-five (45) different colours. Ebony birds in silhouette and the coral adornments on the elephant give the composition that little bit of pop and poison indicative of all great design. The overall colouration is far more veldt like than jungle, but the scene retains a somewhat magical quality owing to the perfectly balanced hues of pewter, red, grey-blue, chocolate brown, soft gold, apricot, coral, dusty lavender, plum, forest green, lime green, teal and sky blue, to name but a few. 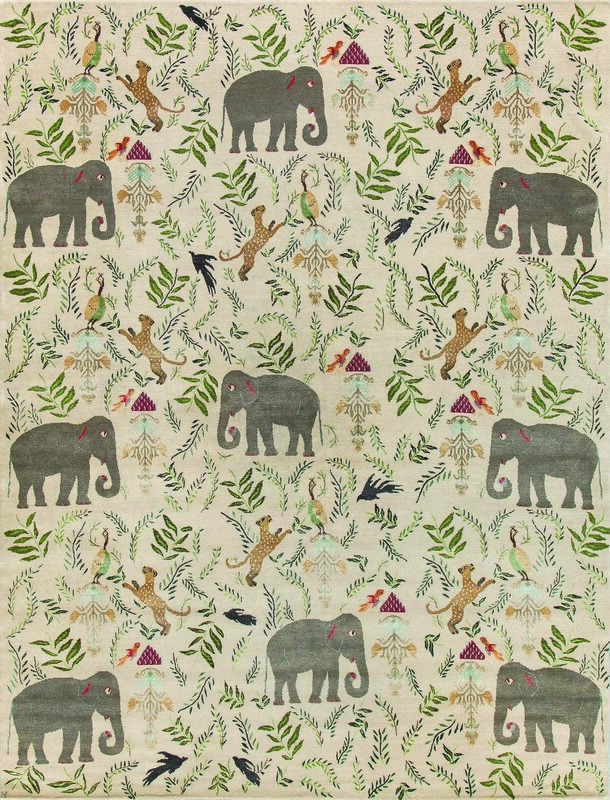 ‘Menagerie’ is knotted in Nepal of a blend of Tibetan wool, silk, and nettle in New Moon’s ‘true’ 100 knot quality and is priced at $16,200 (USD) retail for a 9×12 carpet. 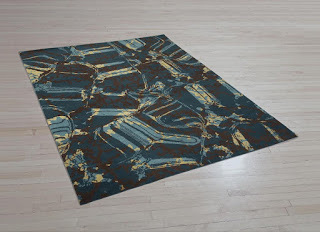 Available wherever New Moon carpets can be found. 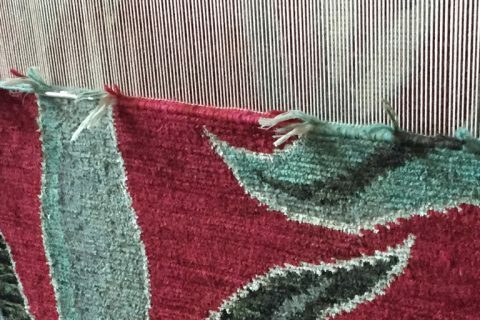 An up close and behind the scenes look at the making of a New Moon carpet set in Kathmandu, Nepal.